Live sessions on Saturday 2nd March 2019 ft. riproaring London art punk noise dolls Nun Habit plus London based folk singer/songwriter Bity Booker. 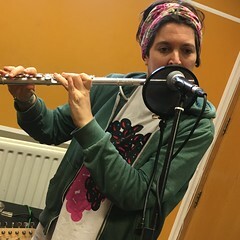 Saturday 23rd February 2019 found Two Worlds Collide and Flame Proof Moth performing live in session on The deXter Bentley Hello GoodBye Show on London’s Arts radio station Resonance 104.4 FM. Live sessions on Saturday 23rd February 2019 ft. Cleave Normalsky’s abrasive song writing project Two Worlds Collide ‘specifically designed to put the listener on edge’, plus the satirical, sardonic bitter sweet songs of Flame Proof Moth. On Saturday 16th February 2019 Resonance 104.4 FM’s Hello GoodBye Show featured live music from Vic Godard & The Subway Sect plus Jetstream Pony. Live sessions on Saturday 16th February 2019 ft. an original 1st wave punk pioneer and still an utterly vital performer to this day, Vic Godard & The Subway Sect (w. Chris Bostock, Sean McClusky & Johnny Britton) plus post-punk indie-pop band Jetstream Pony. The Pay-As-You-Go Hello GoodBye (Part 2) featuring music contributed by listeners who bought airtime for £10 per minute with all donations going towards helping to keep Resonance FM in good health! Also, featuring live music sessions from Jazz infused shamanic poet Alabaster dePlume and South London indie power pop rock trio Bromide.